With the conclusion of the Trans-Pacific Partnership (TPP) negation on Oct 5, people now wonder: when will the agreement eventually take effect? 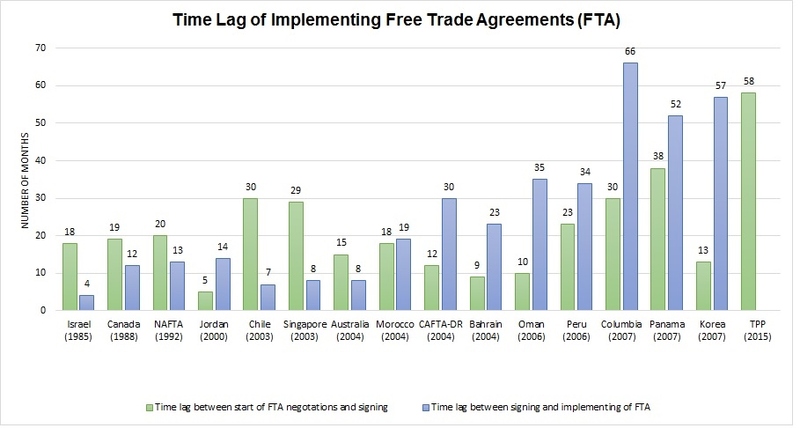 As shown in the chart above, since the 1985 US-Israel Free Trade Agreement, the average time lag between signing and implementing a free trade agreement (FTA) in the United States is 25.5 months (over 2 years). However, since 2006 the average time lag increased to 48.8 months (around 4 years). By the way, are these rules already available, especially for chapter 61/62 ? The increased time in between signing and implementing FTAs tell me that trade partnerships are not on the top of America’s most important issues list. As a developed country who has multiple different trade relationships I feel as though the US does not feel the pressure to create more trade relationships, so they don’t have to rush the process. If one relationship is not solidified for a few years it is not like the US won’t have any other sources of trade. I feel like these agreements are just used as a tool to boost the US’s image, showing their willingness to work with other countries. By creating these agreements they show their intent to be a team player without having to make any immediate commitments. TPP is indeed a big deal. I find it interesting that implementation occurs over such a long period of time, this shows the legal complexity as well as the large scope of the agreement. This complexity makes agreements such as these slow moving to change in a fast moving economy. Streamlining this procedure could help the T& A industry quickly react to changes in the global economy in the future which lend to less skepticism about the benefits of an agreement. People who currently fight against the agreement based off of possible future concerns may be quieted because they know they would be able to express their concerns and make changes if possible problems actualize. This is very interesting to me. Honestly, I never thought about how long it takes to fully implement a trade policy in the first place and then wait to actually see the effect. It is interesting to me that the time lag has almost increased by double in the past few years. I also wonder why it is that countries like Colombia, Panama, and Korea all have such higher lag times than other countries. Does it have to do with the government’s system? Great question! Actually it is mostly because of the US side. Although these several recent free trade agreements (such as US-Columbia FTA) were reached as early as in 2006, because of US presidential election, plus trade was a highly sensitive topic, they didn’t get passed before Bush finished his term. When Obama took the office, he asked US trade negotiators to renegotiate some terms in the agreement (partly because he is a democrat whose view on trade is very different from the republican). It took some time to get the negotiation done and go through the legislative procedure. You see, even though rhetoric about free trade agreement sounds like economics–how many jobs can be created and how many new exports can be achieved, the actual process is very political in nature. You simply cannot avoid politics and many technical legal issues when talking about trade. Much like Allison, I never expected there to be so much time between initiating this FTA and actually seeing it’s results. After reading the comment about how it is due to the US it makes me wonder how anything every gets accomplished, and worrisome due to the fact that we will be seeing a new president in less than a year. Does this mean that yet again we will see a delay in action? I also find it surprising that there is such a lag being that we live in such an instantaneous age, due mainly to technology and globalization, reading this post really made me remember that there are many aspects of our society that do not move as quickly as our daily lives. Great question. This is why there are many speculations on when TPP could eventually take into effect. What makes TPP even more complicated is the similar trade politics in other TPP members, such as Japan and Canada. Will see how it turn out to be. But personally I am confident that TPP will be implemented. I believe that it is not a concern to implement the FTA trade partnerships because it seems like it is not a priority for the U.S. We have many good and close relationships with other nations, however they do not seem worried about one less relationship that they can not build. The U.S. is constantly finding different ways to approach and collaborate with other nations which shows our willingness and ability as a nation to work with others. It is interesting to see how the complexity of making agreements can either works towards or prevent an agreement from forming. But this video shows how the T&A industry is constantly keeping up with these issues and is reacting to changes in the global economy as a whole. Both agree and disagree. For potential winners of TPP, they definitely want the agreement to get passed and take effect asap, eg: export oriented sectors, importers and some politicians. Vice versa, for those who do not want the agreement to be passed (such as labor unions or environmental activists), they are doing whatever they can to stop the deal. Regardless of the positions on TPP, this is a critical deal and serves many strategic purposes–think about what we mentioned in the class about what is happening in the Asia-Pacific region and Obama’s pivot to Asia policy. It is unfortunate that the time lag for trade agreements to take effect has steadily increased. I understand that there are a lot of details that need to be worked out within the trade agreements (Professor Lu showed us a list of some of them in class). Perhaps every time a trade agreement is worked out, they need to sort through details from the previous one/their prior trading methods, and that it why it takes so long for the new agreement to take effect. Furthermore, this also means that the benefits of the trade agreement will take a log time to hit the market, so I think there should be other methods to help the market as it waits for the trading agreements to take effect. Great comment! Unfortunately, it may take longer and longer time to pass future free trade agreements. Basically people have more expectations for these agreements–trade agreements today not only deal with traditional topics such as tariff elimination, but also include more and more new agendas such as labor and environmental standards. These new agendas are more complicated, sensitive and divided with social opinions. That is being said, it is not necessarily a bad thing to have trade policymaking more transparent and involves more open public discussions.